Our research level to the Ringmann cards changed during our work at trionfi.com. First we had the information level of Huck Mayer and on this state I suspected a context to the Imperatori decks, as my article below shows. When getting more information from Ken Mayer, I changed this opinion, although a "small context" still might be possible. 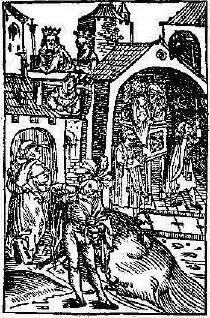 Huck Mayer in the meantime has reached some more information to the person of Matthias Ringmann, and from this it's clear, that Ringmann in a complex situation took influence from the didactical decks of Thomas Murner (Murner and Ringmann were acquainted in Strasbourg (1501-1500), though in hostile manner). Huck Meyer promised to write a summary once. In 1423 the Imperatori deck note from Ferrara informs us, that a game called Imperatori is produced in Florence and imported to Ferrara - probably a new invention at that time, cause otherwise an import from Florence wouldn't have been necessary. This special entry speaks of "VIII" Imperatori-cards - and this "VIII" marks them as being different from that, what is handled in Germany under the name Karnoeffel, Keyserspil or Ludus Caesarum. We know by Ferrarese documents, that Imperatori decks are mentioned in Ferrara variously till 1452 and then disappear, and we know, that these decks must have been different to normal card decks. But we're rather blind, how these 8 special Imperatori deck looked like. In 1507 the humanist Ringmann uses some strange figures to illustrate his teaching book about Latin Grammar. There are 8 figures and an accompanying modern text says, that Ringmann took the 8 figures from a contemporary card deck. We are not able to evaluate this statement at the moment, if it is derived with good understanding of playing card history from the Ringmann text or a little unsolidified from the assumption of the writer of the text. Perhaps further research or a contact to the author will clear up this point. For the moment we've no choice, we just positively assume, that the 8 imperatori cards from Ferrara in 1423 and the 8 cards developed by Ringmann about 88 years later SOMEHOW relate to each other. Well, we don't forget about the unsecurity of this assumption, but we just observe, what could speach for such a connection. We've a positice sign: The humanist Ringmann spend a little time in Italy, relatively short before (ca. 1503/04) his production (1509), and might have observed real Imperatori decks and might have been influenced by them. We've a second positive sign: Ringmann parts his 8 figures in 4 figures of the church and 4 figures of the world. Such an idea might have been naturally born at the council of Constance, which might be suspected as the place of origin for the Imperatori. At the council of Constance a balance of church and worldly reignment was tried, it appears as a philosophical idea - balance between church and worldly reignment - of that political situation. We've a 3rd positive sign: The Trionfi game has incorporated a strange symmetry between the 4 figures Papessa - Empress - Emperor - Pope, especially strange with the figure of Papessa, which had no real representative in the "real medieval world". It's a similar symmetry between church and world as we can observe in the Ringmann cards. As the Trionfi-game might have been developed from a scheme inside the Imperatori-deck, the similarity might be natural and "not surprizing". We've a 4th positive sign. The Imperatori deck might have been developed from the chess game. The chess game has 8 Figures + 8 pawns, so it also concentrates the number 8. "Normal" card decks of the early time had 4 kings, 4 "good" marshalls (Ober) and 4 "bad" or "lower marshalls" (Unter), totally 3 figures in 4 different suits. After some development the 4th figure became the Queen and in Italy the Unter developed in a page. In comparition of this 4 figures (inside the card game) to the 8 figures in a chess game one would conclude, that a King is present, a Queen is present and that the two marshalls are represented by the 2 horses (knights). The "missing figures" would be 2 bishops and 2 towers. If we assume, that the inventor of the imperatori deck had a "chess idea", he naturally in his genious moment of invention stumbled about the fact, that two of the missing figures were churchial predefined: the bishops. Towers appear as a neutral idea, but when the inventor took this course, it was surely a possible and not very hair-drawn idea to interprete them as also "churchial". With the 4th positive sign we're very near to that, what Ringmann did in 1509: 4 figures of the church and 4 figures of the world. A Cup-bearer - he looks like the Magician, but Ringmann simply don't understand the Italian background. and 4 lower figures of the church - Ringmann simply doesn't allow himself to take higher honoured figures of the church like Pope, cardinals or bishops or even a Papessa, probably he feared unnecessary opposition and personal trouble. Or: not Ringmann had the fear, but already the Italian cardmaker, where he got his idea from. But the established Trionfi deck makes an Italian fear unlikely, the variation should come from Ringmann himself. The existence of the Ringmann "cards" just adds to various other also rather vague components, which slightly indicate, that the early Imperatori-deck might have been related to the Chess-game. Also it might help to identify the content of the otherwise unknown 8 Imperatori cards mentioned in the Ferrarese document from 1423, but - of course - a connection between the two productions is not totally reliable. In our intern discussions we consider, that there were not only one sort of Imperatori-deck but also variants. The number of additional cards in an Imperatori-deck mustn't have been always eight and the motifs mustn't have been always the same. For instance: Ringmann presents 4 imperial and 4 churchly figures, perhaps in relation to chess. An interesting idea. The Minchiate, which as name is known from 1466 on, has another interesting feature, and it also gives reason to think about the Imperatori-deck: In its complex content (40 trumps, 1 Fool, 16 courts, 40 pips) the Minchiate has a Western Emperor and an Eastern Emperor, instead of the common Emperor + Empress-pair. The Minchiate is from Florence and Florence with its creative people might have well been the birthplace for the Imperatori decks, in 1423 the court of Ferrara imports the deck from Florence. So it might be, that the unusual Double Emperor in the Minchiate reflects an early Imperatori-Version, which also contained two Emperors. Two Emperors again remind at the chess-game, where two Kings with their people fight for victory. And this is only one further possibility. In the discussion of the Brera-Brambilla deck we will meet another. Generally we assume, that the begin of card playing was more creative than the later development. So - probably there had been many ideas. Europe is great and Italy is great and had many cities. Very much individual development was possible, and we only see as much as one of the 6 blinds touching an elephant. More pictures at Huck Meyer's site. The Chapter Imperatori Decks describes the playing card development between 1420 and 1440, a time of preparation of the later Trionfi decks.